In the previous part of this series on Blogger, we covered the basics of getting started with Blogger. The next big thing is your first post. Blogger is so easy and intuitive, it requires no tutorial. So this article will cover just the basics and leave you to explore into the more deeper aspects and settings. The new post interface looks something like the picture below. The interface is neatly arranged in three rows and two columns. First Row begins with the links to your dashboard and view the blog. It further goes to the rows of buttons on the top left which is the basic Google Plus links. Second Row is the name of your blog and the Post Title. Towards the right is Publish, Save, Preview and Close. Till the time you don’t publish the post, it will remain in draft form. 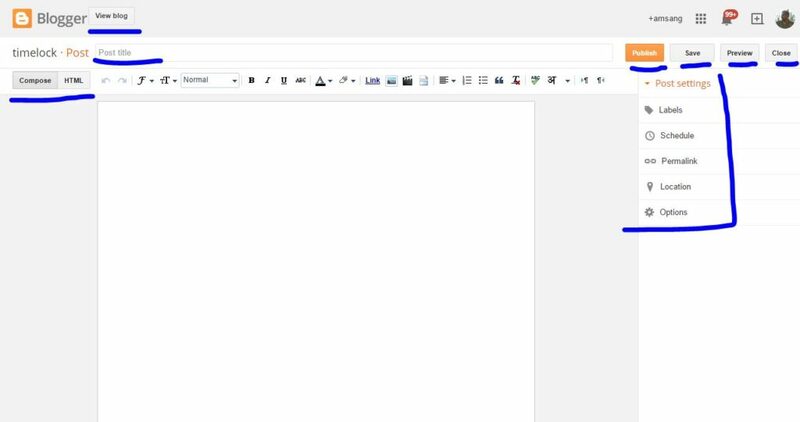 As you keep adding content, Blogger will keep saving your work automatically. You can manually do this by clicking Save. Preview will give you a look of the post as it is. And finally Close will exit the interface in whatever form it is after saving it as a draft. The next Row is all those tools which you are going to use to while typing in your content. Options like font, text size, text colour, insert picture, spell check, etc are neatly arranged in rows of boxes. I would suggest you go over the options one by one to get familiar with the functioning of each. Of Course, you still can straight way jump to the typing part and Publish it. After that comes two columns. The dominating column is the area of white space where you can insert your content. This is the biggest area of the interface and increases with fluidity as the screen size increases. The second column is the Settings which give you options to have greater control over your post. Do not forget to put Labels. They are the same as Tags and figure in the search engine thing to bring your topic/article in limelight. Rest Options like others are self explanatory. Once you are done with entering in your content. Just hit the publish button and view your blog in all its glory!